Suffolk County Crime Stoppers and Suffolk County Police Sixth Precinct Crime Section officers are seeking the public’s help to identify and locate the man who stole merchandise from a Medford store last month. 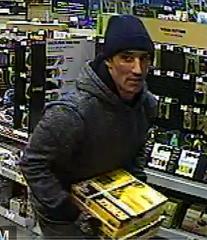 A man stole two Dewalt Lithium Ion Impact Drivers from Lowes, located at 2796 Route 112 on December 19 at approximately 2:40 p.m. The stolen merchandise has a value of approximately $715.